The MOMS Club® of Hopewell Valley, NJ is a chapter of the International MOMS Club, a nonprofit organization formed specifically to provide daytime support for at-home mothers. With more than 50 members from across Hopewell Valley, MOMS Club participants include women who stay home full-time, work part-time and mothers who work full-time at area hospitals, law firms and businesses. Members have children at all four local elementary schools and are involved in numerous activities throughout the community. 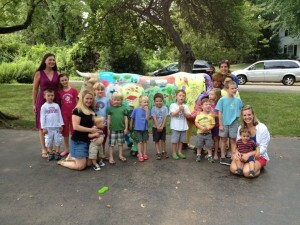 Two key MOMS Club members, Betsy Gicquel and Wendy Deschapelles, led the effort to design and decorate our ox. Betsy is the Executive Art Director at Pretty in Paint Parties, a former elementary art teacher and mother of three who designed and oversaw the painting portion of the ox. Wendy, who spearheaded the mosaic portion of the design, is a mom of two boys and enjoys painting and drawing. Dozens of MOMS Club members and their children participated in the painting, hand printing and mosaic work, working together to help bring Wox to life!